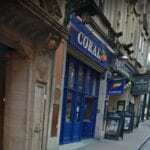 This page shows you all the details and information about the Coral Cannon Street betting shop in Birmingham. Here you can find where the shop is located along with the opening hours and online offers for this top brand. Here is a map listing showing the location of this particular bookmakers shop so you can find it easily if you want to visit and place a bet. 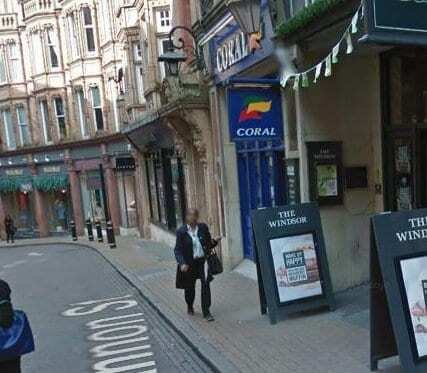 Below are some photos of the betting shop itself so you can see where it is located on the high street if you are ever wanting to pay a visit. 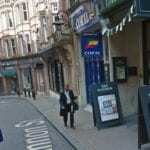 The location is close to many other shops, restaurants and amenities in the centre of Birmingham. To find a full list of these bookies throughout the UK, check out the directory here. 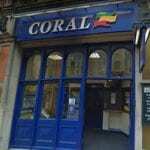 Coral Racing Ltd is a licensed Betting Shop located at 35 Cannon Street in BIRMINGHAM B2 5EE. – Information from Find a Bookie. The license status: Grant by Birmingham City Council as at 28/09/2010. Birmingham is the second-most populous city in the United Kingdom, after London, and the most populous city in the English Midlands. With an estimated population of 1,137,100 as of 2017, Birmingham is the is the cultural, social, financial and commercial centre of the Midlands. It is the main centre of the West Midlands conurbation, which is the third most populated urban area in the United Kingdom, with a population in 2011 of 2,440,986. The wider Birmingham metropolitan area is the second largest in the United Kingdom with a population of over 3.7 million. Birmingham is frequently referred to as the United Kingdom’s “second city”. A market town in the medieval period, Birmingham grew in the 18th century Midlands Enlightenment and subsequent Industrial Revolution, which saw advances in science, technology, and economic development, producing a series of innovations that laid many of the foundations of modern industrial society. By 1791 it was being hailed as “the first manufacturing town in the world”. Birmingham’s distinctive economic profile, with thousands of small workshops practising a wide variety of specialised and highly skilled trades, encouraged exceptional levels of creativity and innovation and provided an economic base for prosperity that was to last into the final quarter of the 20th century. The Watt steam engine was invented in Birmingham. When it comes to sport, the city is home to numerous clubs and teams. 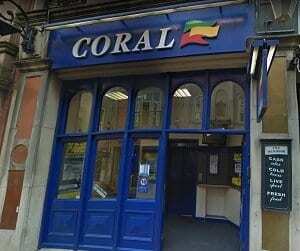 There are many opportunities to bet with Coral if you live locally and support a particular team. Birmingham has played an important part in the history of modern sport. The Football League – the world’s first league football competition – was founded by Birmingham resident and Aston Villa director William McGregor, who wrote to fellow club directors in 1888 proposing “that ten or twelve of the most prominent clubs in England combine to arrange home-and-away fixtures each season”. The modern game of tennis was developed between 1859 and 1865 by Harry Gem and his friend Augurio Perera at Perera’s house in Edgbaston, with the Edgbaston Archery and Lawn Tennis Society remaining the oldest tennis club in the world. You can enjoy tennis betting online too. So make sure to support your local team. When placing bets remember there are different tennis bet types that may be best for you. Similarly you may also place cricket bets online. The Birmingham and District Cricket League is the oldest cricket league in the world, and Birmingham was the host for the first ever Cricket World Cup, a Women’s Cricket World Cup in 1973. Birmingham was the first city to be named National City of Sport by the Sports Council. Birmingham was selected ahead of London and Manchester to bid for the 1992 Summer Olympics, but was unsuccessful in the final selection process, which was won by Barcelona. Today, the city is home of two of the country’s oldest professional football teams: Aston Villa F.C., which was founded in 1874 and plays at Villa Park; and Birmingham City F.C., which was founded in 1875 and plays at St Andrew’s. Rivalry between the clubs is fierce and the fixture between the two is called the Second City derby. Aston Villa are 7-time First Division champions and the 1982 European Champions, but currently play in the Championship following their relegation from the Premier League in the 2015–16 season. Birmingham City also currently play in the Championship. Seven times County Championship winners Warwickshire County Cricket Club play at Edgbaston Cricket Ground, which also hosts test cricket and one-day internationals and is the largest cricket ground in the United Kingdom after Lord’s. Edgbaston was the scene of the highest ever score by a batsman in first-class cricket, when Brian Lara scored 501 not out for Warwickshire in 1994. For information on cricket bet types, please have a look around our website.